On June 2, 1835, Giuseppe Melchiorre Sarto saw the light of earth at Riesi, Province of Treviso, in Venice; on August 20, 1914, he saw the light of heaven; and on May 29, 1954, he who had become the two hundred fifty-ninth pope was canonized St. Pius X. Two of the most outstanding accomplishments of this saintly Pope were the inauguration of the liturgical renewal and the restoration of frequent communion from childhood. He also waged an unwavering war against the heresy and evils of Modernism, gave great impetus to biblical studies, and brought about the codification of Canon Law. His overriding concern was to renew all things in Christ. Above all, his holiness shone forth conspicuously. From St. Pius X we learn again that “the folly of the Cross”, simplicity of life, and humility of heart are still the highest wisdom and the indispensable conditions of a perfect Christian life, for they are the very source of all apostolic fruitfulness. 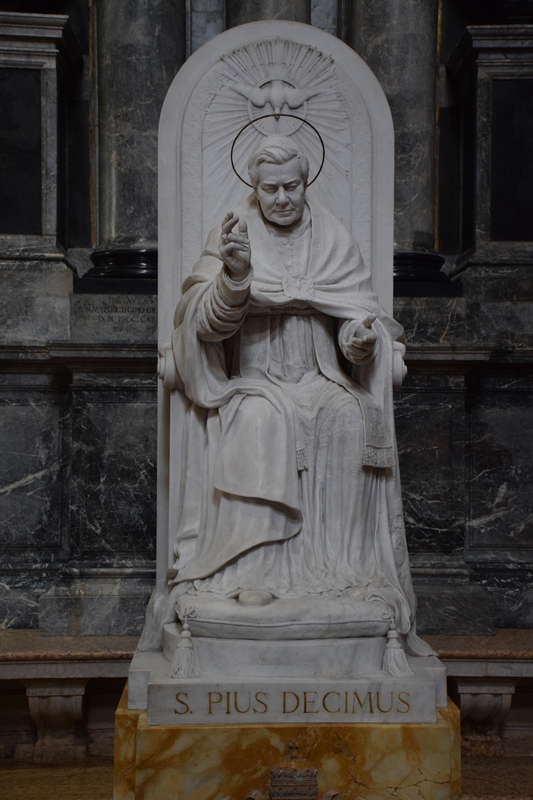 His last will and testament bears the striking sentence: “I was born poor, I have lived in poverty, and I wish to die poor.” His feast day is August 21.